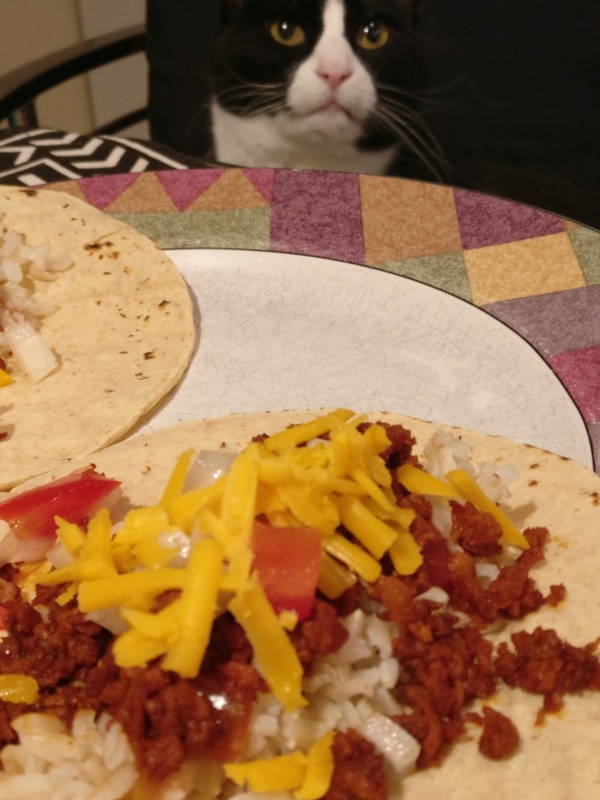 Clarabelle wants a taco. This is what a vegan taco, made with Tofurkey's tofu chorizo and cashew cheddar cheese, looks like. This is how I promote veganism. I show you how freaking awesomely delicious and beautiful what I eat is. The spammers never stop trying to destroy our freedoms. Where are the real vegetables? I see a lot of processed vegetable protein, but how about the green stuff? I deleted my first two responses because I don't want to be that...um...accurate. To those who are interested in vegetarianism/veganism for whatever reason, do not be deterred from trying to reduce or eliminate animal products from your diet by what I call the "vegan nazis". Those are the people who regard the perfect as the enemy of the good. They demand an accounting for your meals if they don't fit their religion. What they are doing is called "virtue signaling". You owe them nothing. You owe them no explanations. Try tacos like I made up there. I make my own cashew cheddar, but you can buy vegan cheeses or leave them off your taco entirely or use a little (not much...milk is really bad for you and promotes breast and prostate cancer) real cheddar on your otherwise animal-free taco. It's a start, right? Find recipes you like that are meat free and then work them into your diet. If you eliminate only one meaty meal a week and the rest of the time you eat as you have always done, you've made a step in the right direction. Don't let vegan nazis push you away from enjoying an animal-free meal because of their emotional problems. The food I make is so good it is insane, and it is good for you. Go ahead, try a cruelty-free meal.